This post was sponsored by AppKarma. Sometimes your brain needs a break, especially if your brain has to work a regular 9 – 5 job (like many of our brains do). Taking 15 minutes to play an online game isn’t unusual for many hard-working folks. But what if you could still earn money while you play a game or two on your phone? Well, now you can, with AppKarma. AppKarma's $100 giveaway just ended! See details and winner's usernames below. 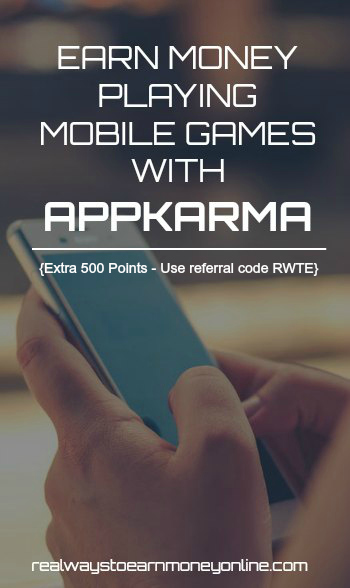 AppKarma is the reward app that pays you in cash and/or gift cards to play mobile games – it’s really that simple. Used by over 3.5 million users all over the world, AppKarma is one of the highest-rated reward apps in Google Play, with a 4.7/5 rating. In addition to being user-friendly, this rating is likely because rewards are easily earned and delivered directly in the app. Users never have to wait around for physical gift cards; the payoff is immediate. To begin, browse through the app offers inside AppKarma. Install the app offer(s) and follow the requirements. For example, “Install + Reach Level 5,” “Complete Tutorial,” etc. After accruing the minimum amount of Karma Points, you can redeem said points for gift cards and PayPal cash within the app. Once points are redeemed, the gift card will appear in your “My Rewards” section of the app. Cash payments are made via PayPal within 24 hours. How Does AppKarma Pay Out? Rewards are available for Amazon, iTunes, Starbucks, Google Play, PayPal cash, and many more stores. In addition to completing app offers, there are multiple ways to earn Karma Points. For example, users can earn achievement badges and get extra points simply for signing up, checking in 10 times, completing 5 offers, etc. Other ways to earn Karma Points include boosting offer points by leveling up, completing Karma Plays, and inviting your friends. A VIP upgrade is available if you have a substantial social media following. It does. The beauty of AppKarma lies in its uniqueness – the app has more offers compared to other similar apps. It's the only app with a Karma Play feature (Android Only) that allows users to earn additional daily rewards for keeping and playing with the apps they were rewarded for. Additionally, it has low cash out options, making it easy to turn your points into dollars in your bank account (PayPal payments are made within a day!). How To Sign Up for AppKarma? RWTE readers will receive 500 points to sign up if they use our upgraded referral link or the referral code RWTE. Click here to check out AppKarma and receive 500 points for signing up. Note: For iOS users, AppKarma is not in the App Store. Instead, you will be taken to appkarma.io, and will be prompted to install a companion app called Word Karma. Opening Word Karma will direct you to the AppKarma web application where you’ll see offers to try apps and games for rewards. Android mobile users will be directed to the Google Play store. If signing up via your computer, you will be directed to text yourself a link to install the app. The Giveaway: 4 $25 gift cards will be given away. Winners can select from Amazon.com, iTunes, Google Play, WholeFoods, Starbucks, and Target, to name a few! Rules: The user who completes the most offers will be guaranteed a gift card. Three additional winners will be determined by a random drawing. To qualify, the user must complete at least 3 offers in the app. Chances are greater for those who complete more offers. Duration: Drawing will occur on September, 19, 2017. The winners will be contacted by AppKarma and will receive their digital gift card codes immediately – no sitting around waiting for a physical gift card to appear in your mailbox. Update 9/22/17 – Winners of the $100 giveaway announced! You should have been contacted by AppKarma if you were a winner. Congratulations!! Best of luck, and happy playing!